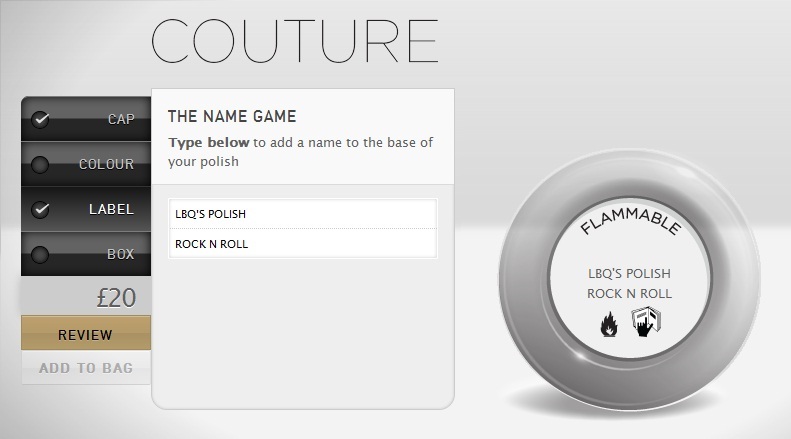 Have you ever wished you could make a polish which was as personalised as your Facebook account? Ever wished you could switch that cap with this one and add in a hint of purple? Nails Inc have created ‘Couture’ where you can create our very own personalised nail polish, choosing the cap, colour, packaging and even the name of the polish itself. 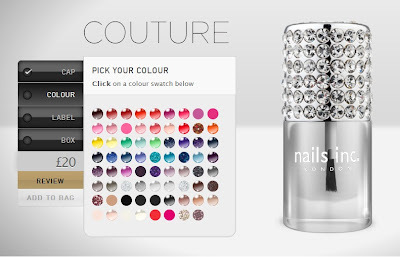 Through a simple app on their website you can choose from a variety of bejewelled and studded caps, pick the perfect shade of polish for you, name it, box it and even choose the stickers to adorn the pack with. I love this service and think it’s a great gift this Christmas for the one you love. It only costs £20 too, which considering you get a completely personalised Nails Inc polish delivered to your door, is an absolute bargain. Available from their website here. Next Post Minty Fresh… Face? Very cool…love this! I love the blingy cap! Ooh this is very exciting indeed! Some posts are just mean't to be commented on, this is 1. Thank you for an outstanding read, so challenging to find these days.